So, when we were away something happened and I wasn’t sure if I’d tell the story or not. And that’s my “secret.” On the last day in Jackson, when we were getting ready to go to the airport, Dylan wasn’t having a good morning. You know… meltdowns and things like that. It was cold out, really cold, we were in the hotel lobby and my husband left to go get the car. And that is when the world ended. Dylan had the biggest meltdown ever (every meltdown I think is the biggest now) and I was holding his hand tight. He wanted to run outside, on the snow, after his dada, where a bunch of cars and trucks were coming and going. I held his hand and he threw himself on the floor like dead weight. He was screaming like a crazy person and I was feeling really bad, really tired, and didn’t know what to do anymore. My husband came back with the car, I was holding D and taking him to the car. When I was holding him I noticed he wasn’t moving the arm I was holding when he threw himself on the floor. Did I break it? Did I just break my son’s arm? I instantly told my husband as we were in the car and I was kinda freaking out. Dylan was crying so much that he fell asleep in the carseat after screaming for five minutes there. If he manage to sleep, I didn’t break his arm (or wrist, or hand, or finger I guess,) but something was wrong. He wouldn’t move that arm and we couldn’t touch it. Since we really didn’t want to miss our flight and nothing seemed to be broken, we decided to go to the airport and then, if we needed, we would go straight to the hospital when we land in NYC. Pretty bad parenting, right? That’s what I was thinking! We got the airport, Dylan still not letting us touch his arm and kinda crying. The arm seemed fine, nothing was swollen, red, purple, blue, black… I decided to give him some Tylenol and it was almost time to board. I was a mess. Right before we started to board, I was holding sad Dylan and he asked to get down. I let him and he started running, playing, like nothing had happened! Like if the past two hours just did not happen. He was moving his arm just fine, we boarded, he was great on the plane and all was good. I, on the other hand, was still shaken by it. The thought I could have hurt my son when I was trying to protect him, make him safe, made me desperate. Terrible twos are terrible not just for the toddler. It’s a constantly struggle for the parent to do the right thing. Dylan is 20 months now and his is definitely in this phase. Is a phase, right? 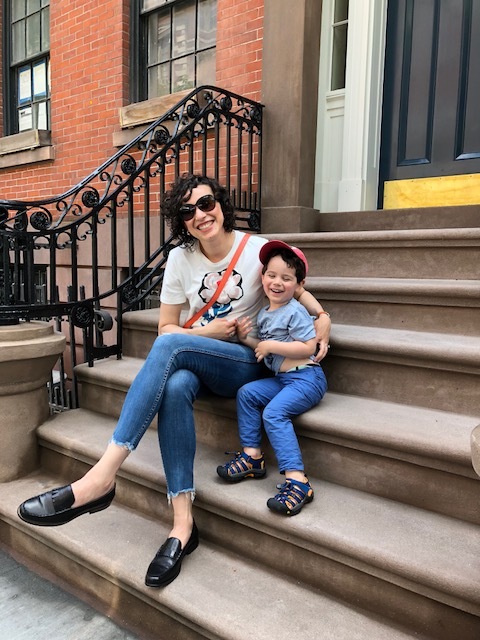 I’m trying to keep my cool and trying to pick my battles really careful, otherwise motherhood becomes something not enjoyable and I want to enjoy it. Some days are good and some days he throws himself on the floor a few times, and I’m letting him do it as he needs to get his frustration out. I try to comfort him every time and let him know I’m there, always.